Tyres play a major role in a person’s driving experience as they are the fundamental connection between the car and the road surface. When your original tyres are worn off and the time for buying a new set of tyres comes, it is very important to know all the factors that are to be kept in mind . One of them is the size of the tyre. 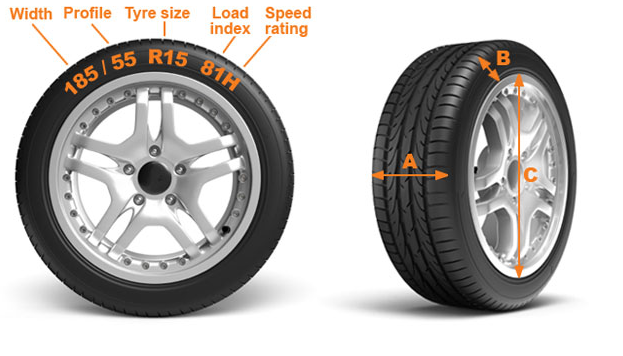 You should know how to read the size of your tyres so that you will be able to choose the correct ones for your car. Generally it is written on the sidewall of the tyres and is represented in a standardized format. For example, 185/55 R 15 81H. The series of numbers and alphabets could seem to be slightly complicated at a first glance, however, the reading is quite simple in real if you know the basic components of your tyre. 185 mm is the measurement of the section width of the tyre. It is also known as the tread width of the tyre. 55 is the percentage of the tread width that contributes in making the height of the sidewall. It is called the aspect ratio of a tyre. Here, an aspect ratio of 55 indicates that the section height of the tyre is 55% of the section width of the tyre. Here, R represents the Radial contruction of the tyre. This is the most commonly used contruction of tyre. However, you can also find the letter B written on some of the tyres that indicates belted bias or cross ply tyres. 15 indicates the diameter of the rim and is measured in inches. Here, 81 refers to the load index of the tyre. Load index is basically the maximum weight limit that a tyre can carry. It is represented by a two digit or three digit numbers that depicts the load carrying capacity of a tyre which can be determined using. For example, if the load index given on the tyre is 95, then it depicts that the tyre is capable of carrying a maximum load of 690 kg. Here, H refers to the Speed Rating of the tyre. It is basically the maximum speed that the car can maintain with the given tyres. It is denoted by an alphabetical letter and is mentioned at the last of the whole series of the sidewall reading. For example, if a tyre has got a “S” rating then it can reach a maximum speed of 180 km/h.